He may only have been on the pitch for a couple of minutes, but Rafael Camacho still managed to play a decisive role in Liverpool’s 4-3 win over Crystal Palace. The 18-year-old was thrown into the action in place of Mohamed Salah in the 94th minute as the Reds battled to hold on for all three points. His introduction marked a direct response to James Milner’s sending off, which had momentarily seen the likes of Roberto Firmino and Xherdan Shaqiri slot in as make-shift right-backs. Such was Palace’s threat late on that Klopp turned to the teenager to help hold the fort, only for Max Meyer to score a third for the visitors to set up a tense finish. 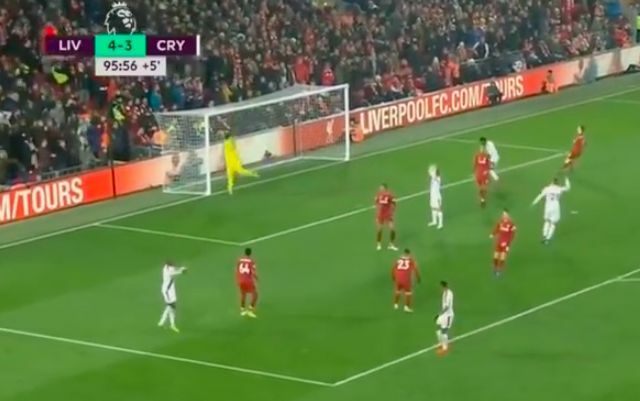 Klopp was restless on the sidelines, the Anfield faithful were beginning to run out of nails, Liverpool were throwing bodies on the line for the cause. Reds held their breathe as Palace talisman Wilfried Zaha plucked a cross from the air with the final seconds ticking down, threatening even more drama. Fears of how he had tormented James Milner in the first half loomed, with Camacho the man tasked with stopping him in his tracks. Stop him he did.